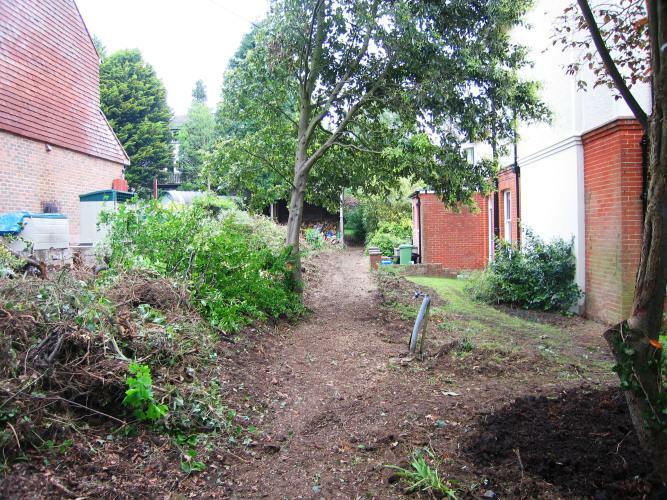 Burgess Hill – reviving an Edwardian garden to meet modern needs. 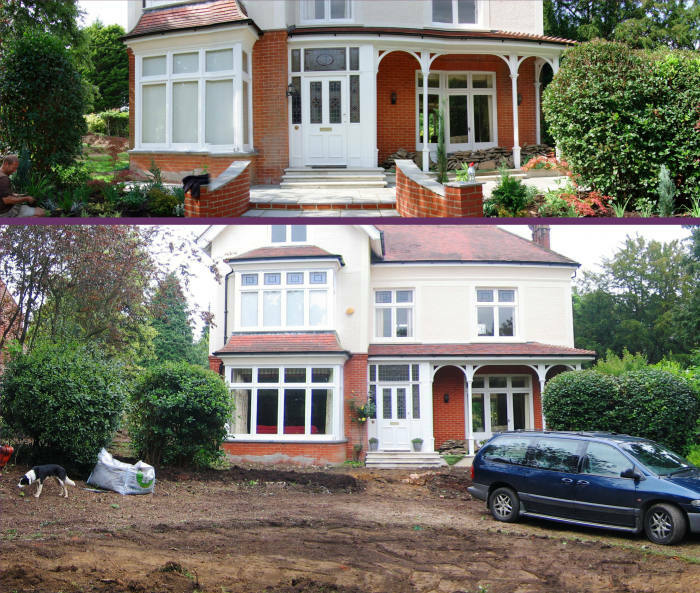 Our clients were completely restoring their beautiful Edwardian house in Burgess Hill, and they invited Lovely, Lovely, Lovely to refurbish the garden. Naturally, they wanted to have a beautiful garden, in which they could relax and dine with friends and family. 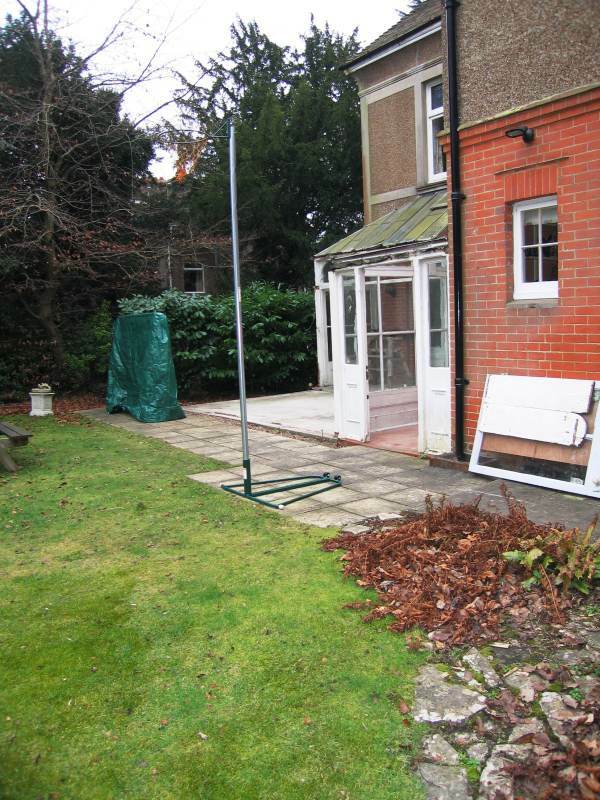 They stipulated that the garden must be neat and pretty, whilst providing facilities for their children’s more boisterous leisure activities. A further requirement was that the garden should require minimal maintenance, as our clients did not regard gardening as a favourite hobby! The existing garden had many large and mature handsome specimen trees and shrubs, but it was overgrown and with large spaces wasted, largely as a result of their earlier having been given over to uses that were no longer current. Our clients were understandably keen to see these spaces used effectively in the new scheme. 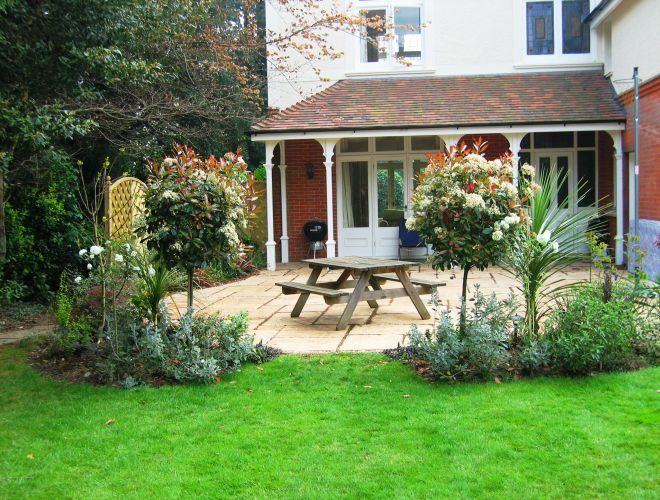 To meet these requirements, we designed a new terrace and planting for the rear garden, and recommended a landscaper to execute the work to a high standard. Once the terrace was laid, we prepared the soil and planted the beds with shrubs and other plants, carefully chosen to complement the site and to combine beauty with neat habits, thereby to reduce the need for regular maintenance. We thoroughly reviewed the existing population of trees, and prepared a development plan that identified those to be kept, those to be pruned, and those to be removed. We also planned judicious planting of new trees. 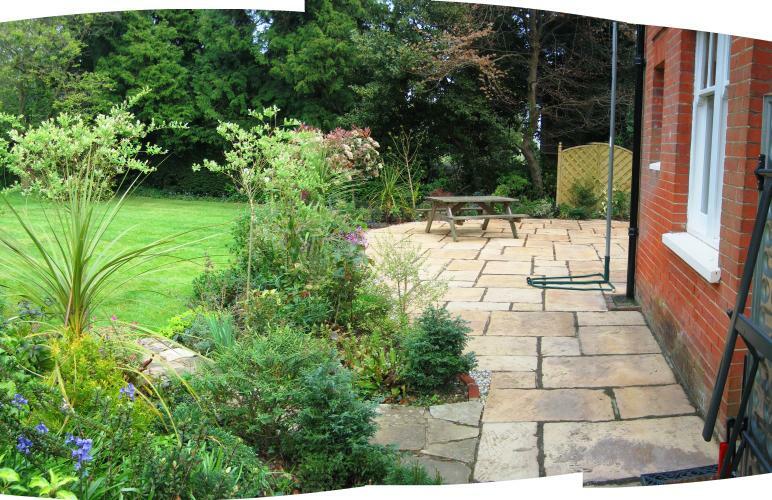 Once the rear garden was looking good, our clients asked us to tackle the gardens to the front and side of the house, where there were large areas, overgrown and ragged, which restricted access and which provided insufficient car parking. At the side, we cleared large swathes of overgrown, unused space and made it into handsome and ornamental gravelled seating areas for occasional use. These are laid out in generous curves, interspersed with planting. The edging of brick and granite sets with an infill of gravel looks pleasing all year round and requires little maintenance. We also created clear areas for work and to allow bins for waste and recycling to be stored neatly and unobtrusively. To the front, our new scheme included remodelling the terrace and the central flight of steps leading to the house. 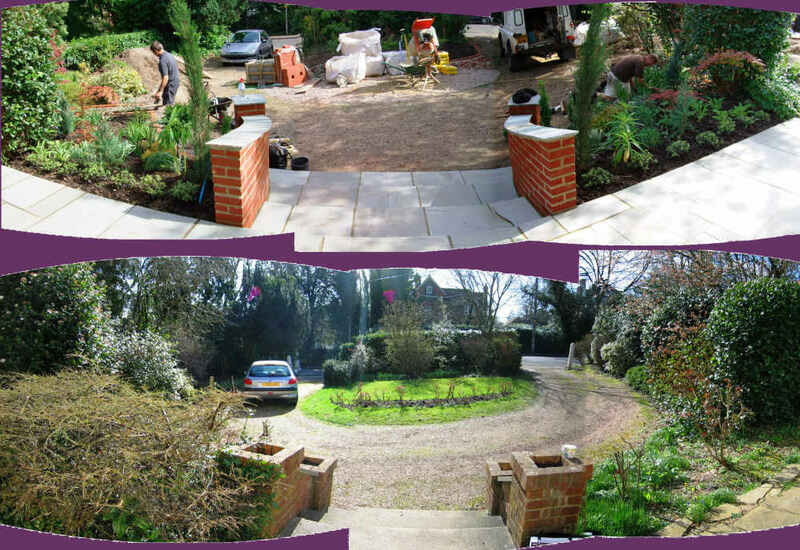 We also radically reshaped the flower beds to improve flow for vehicles and we created new car parking spaces. The result is an elegant in-and-out driveway linked to the house by broadly sweeping stairs that enhance the handsome frontage and that draw the house and garden nicely together. Throughout, we paid close attention to selecting good quality materials that were in keeping with the splendid style of the house. Before: the main view from the house as we found it. A bare, concrete apron, tired paving and no plants nearby means a lack of colour or pleasing shapes. 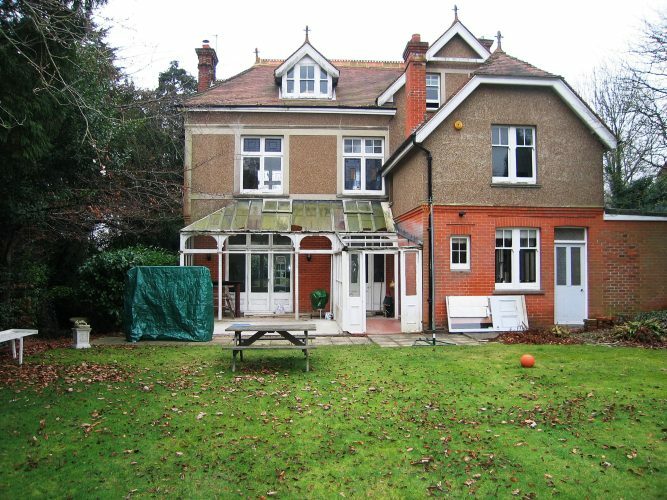 After: the rear terrace seen from the garden. Dressed and ready to be enjoyed. Progress: the rear garden at the outset. A rather sorry scene, with a cramped, concrete terrace, a run-down loggia, and poor access around the side. Progress: the rear garden under construction. The new, larger terrace has been installed. Its more generous area, its curves and its harmonious paving have already lifted the mood. 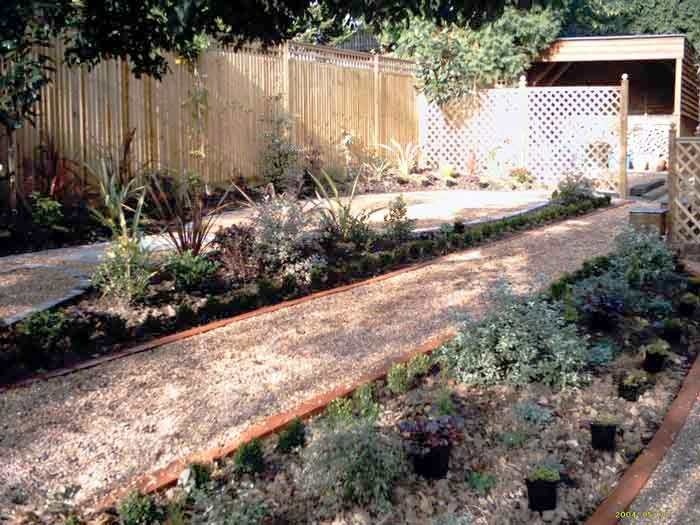 Progress: the rear garden after planting. The beds have been cut in soft curves to tie in with the new terrace. The planting includes carefully chosen uprights to delineate the access between terrace and garden and to frame the views out from the terrace. The clients’ builder has replaced the decrepit glazing of the loggia with a tiled roof to create a cooler, shaded effect. The rear pathway before development. The rear access is uninviting, narrow and ugly and the view is constantly drab. The rear pathway comes alive. This is barely recognisable as the same place shown in the previous photo. 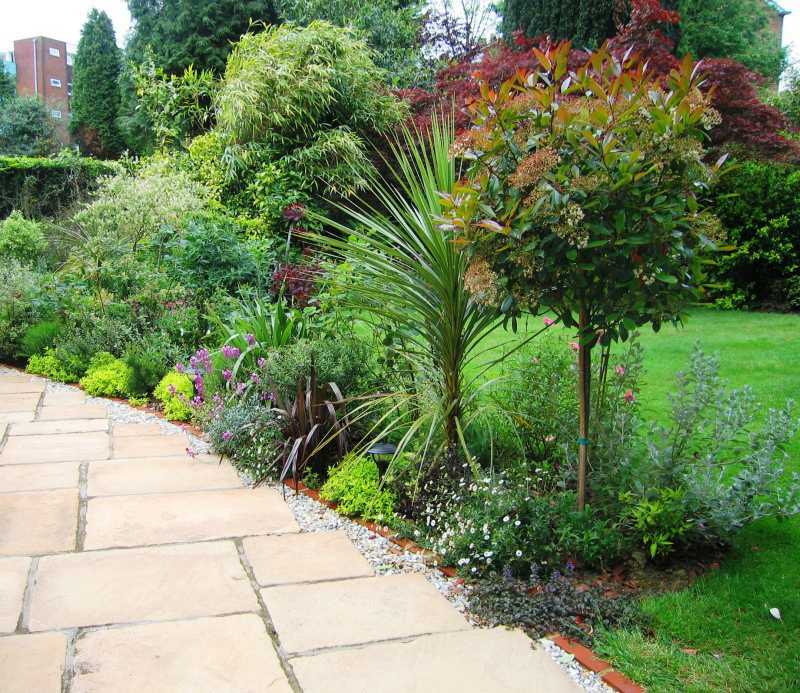 The paving has a warm, natural quality to it and the planting is soft, colourful and easy to manage. The rear garden immediately after development. As this view from the house shows, the lovely curves and attractive plants bring the garden nearer to the house, whilst making it look much bigger. The view along the rear of the house is most unprepossessing. The new terrace is broad, handsome and truly inviting. The side access path was overlooked from the neighbouring house, which sits lower. We designed an attractive, closed trellis sited to provide excellent privacy, without blocking the neighbour’s light. Before: at the side of the house. Before: at the side of the house. 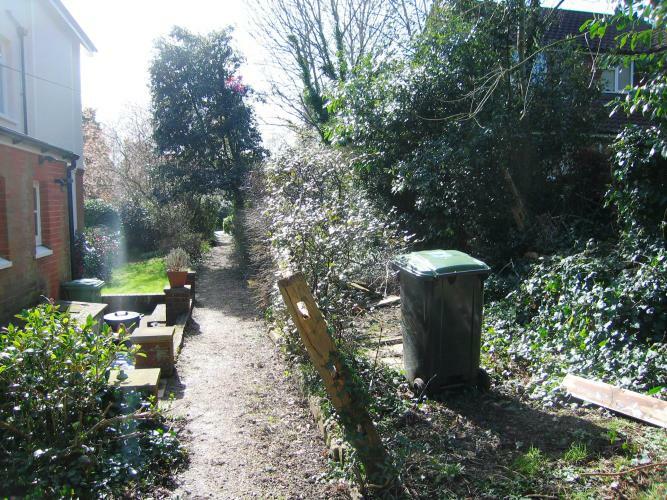 The outlook is marred by large areas of poorly-utilised, semi-derelict land. After: at the side of the house. 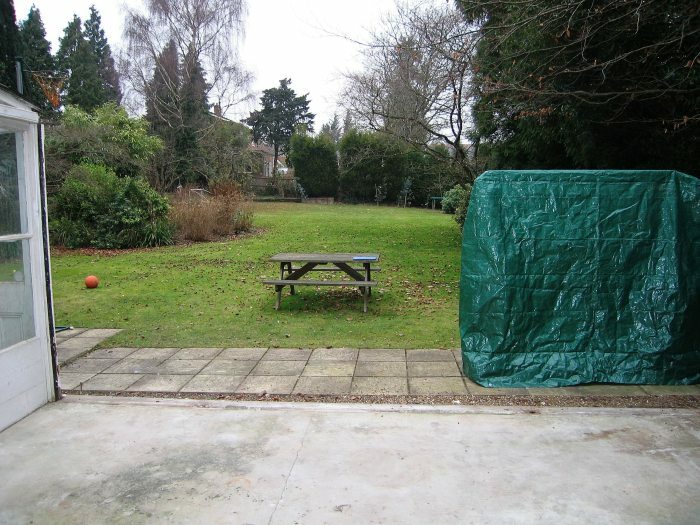 The area has been transformed into well-proportioned space for occasional use. 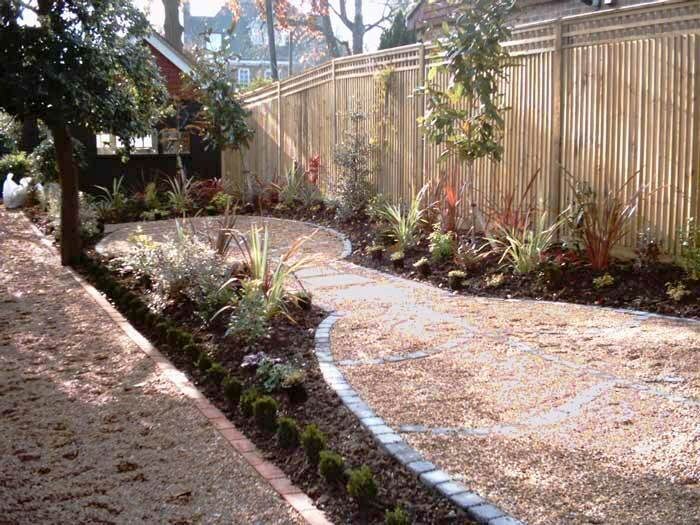 Brick edging and gravel has been used for the main footpath through, whilst the larger space has been edged in contrasting granite sets, which are also used to create sweeping curves in the body of the gravel to provide more visual interest. This photo is used by courtesy of Nik Collier at Secret Gardens, who carried out the hard landscaping here to our design. Progress: at the side of the house. Here we are clearing the old scrub , weeds and rotten fencing. We have recovered an impressive amount of space and improved access to the wood store beyond. The clear and good-looking pathways with neat pleasant planting alongside provide a safe and secure access to the wood-store, which is screened by trellis. The screening will become complete as the plants climb to cover the trellis.This photo is used by courtesy of Nik Collier at Secret Gardens, who carried out the hard landscaping here to our design. Even in brilliant sunshine, this handsome house is diminished by its drab surroundings. We started by removing the old and unappealing steps. We cleared the area, setting aside for later re-planting the bushes that were worth relocating. The upper photo shows the elegant, sweeping steps shortly after completion. 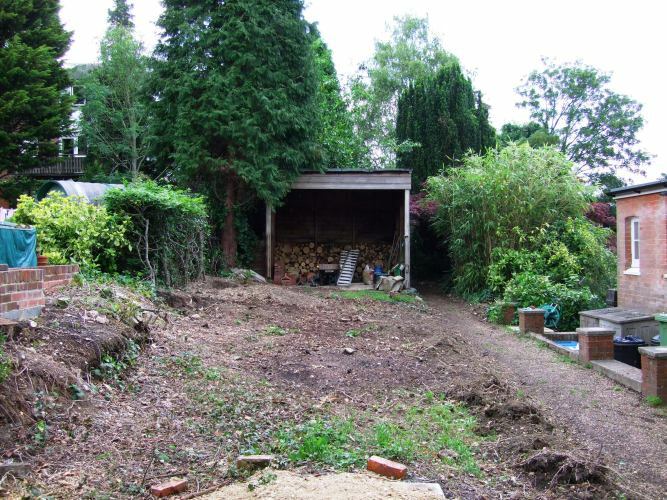 The lower photo shows the cleared space ready for the transformation. The upper panorama shows how the new steps sweep expansively, creating a generous welcome to the light and elegant terrace and then to the splendid house. By contrast, the lower shot shows the mean and somewhat municipal look of the old steps.